“It was on a bright Sunday afternoon (October 02, 2016) that I received a congratulatory email from NITDA confirming that I was successful in the rigorous scholarship aptitude test I wrote on Wednesday (9/28/2016), 9am at Public Service Institute (PSIN) Dutsen Alhaji, Abuja. I was elated by the great news and my hope for continuing my studies up to the postgraduate level was revived. 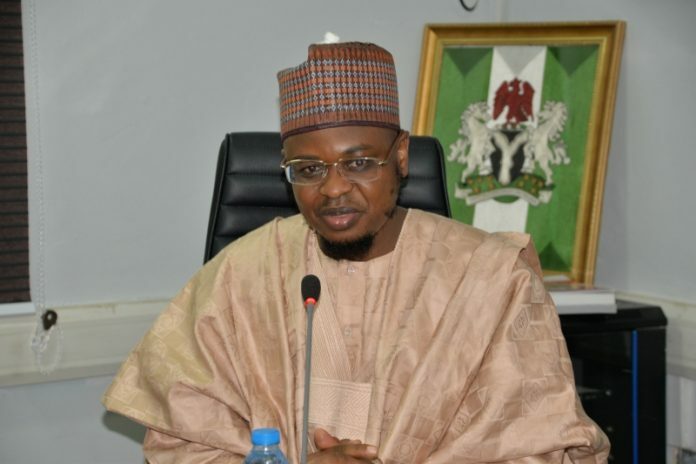 That was my first time of visiting Abuja”, an elated Nigerian who wrote the exams of National Information Technology Development Agency (NITDA) told Secret Reporters. But this jubilation is fast turning into sorrow as the agency is about denying them what they merited for no concrete reason, Secret Reporters has learnt. Following their success in the exam, the candidates representing their respective states and geo-political zones were invited for a one-on-one interview and credentials sighting which did not hold on the said day due to the change in administration of the agency. They were told to go back home with assurance that they will be contacted. Days passed, weeks went by and months elapsed and none of them received any correspondence from NITDA. Some of the scholars decided to follow up and inquire about the status quo by contacting notable staffs of NITDA but were however persuaded and kept assuring them that they haven’tbeen forgotten but were doing all that is necessary. On one occasion, they were told that the reason for the delay was because they are negotiating with international institutions for their admission. This rekindled their spirits and kept our hopes alive. They came up again with another tale that they are waiting for the budget to be passed before they will eventually be contatcted officially. When the budget was passed and NITDA was contacted, they came up with another story of how their fiscal year was different from that of the country that theirs would commence August. “We continue contacting them but they resorted into complicated tactics in a bid to sideline us. In the advertisement, it was stated that the scholarship would be local which we fully understood before we rolled in our applications (although the reason for the change to local seemed unbecoming). We were also aware that the country was in recession, which was one of the reasons we received from NITDA. But it can’t be so bad that a nation won’t be able to provide scholarship to absorb its own citizens into its own institutions”, a candidate lamented. 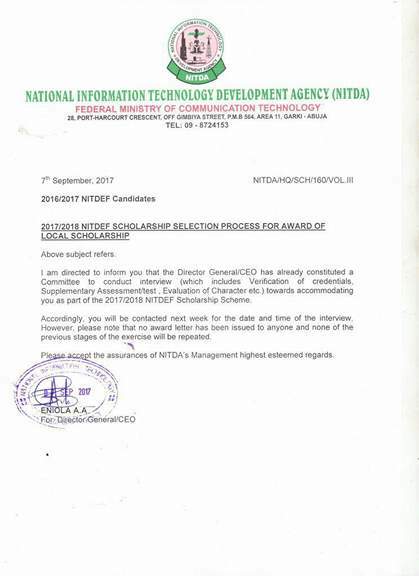 After wasting about a year of their lives, hoping that they will be sent on the scholarship, NITDA sent them a letter on September 5th 2017 terminating every engagement with them and urged them to wait for next year exercise. Secret Reporters obtained the message sent to them in the course of the tortuous journey, which is reproduced below. 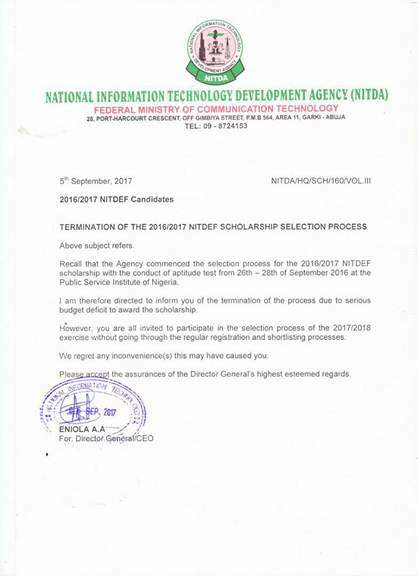 Following your application for the NITDEF Scholarship, you are hereby invited for a Computer-based Aptitude Test on 9/28/2016 by 9am at Public Service Institute (PSIN) Dutsen Alhaji, Abuja. Compulsory requirements: Valid ID, Application Printable Page and Employment letter as lecturer from University for PhD Applicants. Following your performance during the Just concluded aptitude test, you are hereby invited for a one on one interview on the 4th of October by 10am @NITDA HQ, Abuja. 1) The Agency places an advert in two National dailies. 2) The Agency opens the portal (scholarship.nitda.gov.ng) for application, which will be open for 6 weeks from the date of advent. 3) Qualified applicants are shortlisted to write an aptitude test and contacted via email and SMS. 4) Successful applicants are notified through email and SMS. 5) Verification of original certificates and oral interview of successful applicants. 6) Release of award letters to successful candidates. A twitter agitation by the scholars has twisted the hands of the agency with a letter sent on 7th September 2017 and signed by one Eniola A.A that they will be accommodated for the 2017/2018 scheme.